There's nothing worse than holding an ice cold brewski on a hot summer day and having no way to open it. 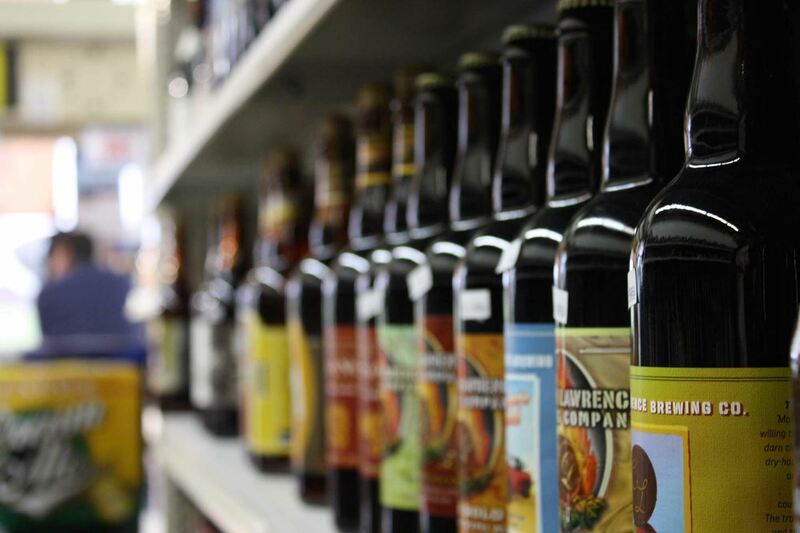 If you're a Bud fan, you'll have no problem opening the bottle because most mass-market beers have twist-off caps. But if you have a taste for finer, more expensive brews, you'll more than likely run into the pry-off caps. Pry-offs are used mainly because companies believe it provides a better seal against one of beer's greatest enemies—oxygen. Plus it's a cheaper alternative for craft brewers than using screw tops. But let's get back to actually popping off that pry-off. If you don't have a bottle opener handy, and you're not willing to injure your hand trying to pull it off, then you'll need to get in tune with your inner MacGyver. If you're a smoker, your lighter works great. But what if you don't smoke? What are the other DIY bottle opener options out there? Firstly, the most likely instance is that you have another beer bottle on hand, which makes for a great bottle opener. Just hold one bottle upside-down, cap to cap to the other one, and apply pressure. As long as you aren't drinking the last beer in the fridge, this trick is a serious one to have in your arsenal. 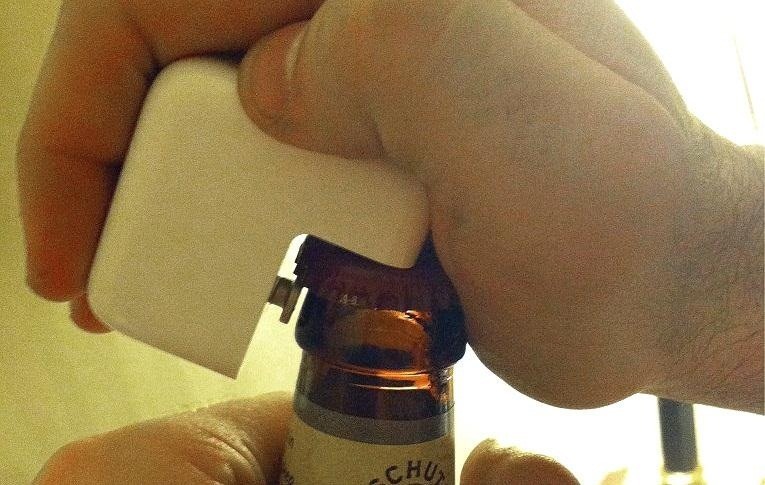 Use your iPad's power adapter to open your bottle. You just need to pull the little wall plug (or cord) off and use the AC adapter as your bottle opener. This will also work with yout Mac's power adapters. If you're not a Mac or iPad owner, surely you're a countertop owner, which makes for a fine top-popper. But you probably shouldn't to this in a public place, since it might damage the counter. You can also do it with a normal piece of paper. Some folks use their old CDs and DVDs for coasters, but they can also be handy bottle openers. Below, Brandoskey shows how quick and easy it is to knock that top off. What could be more convenient to use as a bottle opener than your wedding ring? The video places a lot of emphasis on using a gold ring, though I would assume you wouldn't want to do this a lot with an actual gold ring considering how soft gold is. Trying to open a beer why you're reading this? Then grab that computer mouse in front of you. It's not just for clicking. The Radost shows you how (in mid-game, too!). Upon making this list, my friend Beth informed me that she had seen people open bottles with nothing but their own teeth. Naturally, I said "intense!" and immediately began searching to see if this could actually be done. And guess what I found? Not many folks will be trying to open a beer on the side of a mountain, but if you've got a rock climbing carabiner (or just any metal carabiner), it's got a nice little latch on it perfect for pry-off beer caps. I don't recommend doing this last one unless you seriously know what you're doing. That being said, it's one of the coolest things I've ever seen! I mean, c'mon... it's a freaking chainsaw. What if you're more of a wine drinker? How are you going to get that cork out of the bottle without a corkscrew? If you've got a screw, screwdriver and a hammer, you're good to go. So, what do you think? Obviously there are more ways to open beer bottles without a bottle opener, but there's just way too many to put in one article. Can you think of any other good ways? Tell us in the comments! I prefer to use the handle end of a fork or spoon as a lever. Grasp the top of the bottle so your thumb and index finger circle slightly above the top of the bottle. Take the fork handle over the big knuckle at the base of the index finger and under the cap. Press down on the tine end of the fork and pop the top. Done right, the cap isn't bent and can be popped back on with a firm tap.